You may have noticed a new article of mine caused a bit of a stir during the last week. If not, check out my latest post on The New York Times Motherlode blog. The title, “How to Be Jewish at Christmas.” My original title was not so pithy, but says a little more: “Preschooler Teaches Mom How to be Jew at Christmastime.” More than 100 people – and rising – have now commented on the piece, a story about how my Jewish son surprised me with his politeness and diplomacy when a stranger asked what Santa was bringing him. 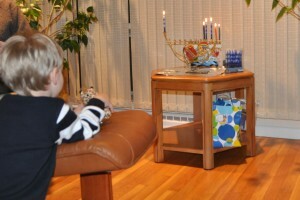 Simon admires the candles on his and one of our family menorahs. My son simply stated the truth: He doesn’t celebrate Christmas. He celebrates Hanukkah. He said it with a smile without a trace of anger or sarcasm. Of course, he’s 4. That could change, but my hope is he will always be respectful in such situations. The debate on the site has been civil and thoughtful. Sure, a few people chalked up my musings to the whines of an overprotective mother. A few wondered why I did not also mention every other non-Christian religion in the world in my piece and also pay homage to atheists. But many people got the message. As a parent, I want my child to grow up secure enough in his own religious identity that he does not feel the need to hide it. One of the more recent commenters wondered why no one has written a post called “How to be a Jew at Hanukkah.” I’ve written such articles before, though not in an instructive manner. All of us have to figure out what works best for our own families. 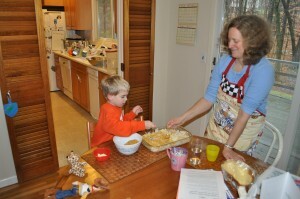 Simon helps me make noodle kugel, one of our traditions at Hanukkah. 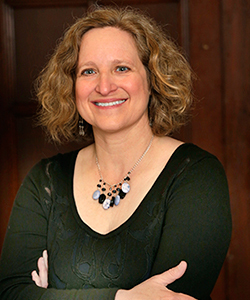 In our home, we give Hanukkah and the more significant Jewish holidays a special place in our lives. We have taken pains to not turn Hanukkah into something more than it is. We don’t, as I’ve written in the past, shower our son with gifts. We give each night a theme and emphasize togetherness and Jewish ritual over commercialism. Yes, our son gets some presents – a set of used books on book night; a wooden toy to paint on craft night; a book about giving to others on Tzedakah night; a CD of his favorite children’s artist on music night. But more importantly, he gets to spend time with friends and family on several of the nights. Tonight, he proved that he has absorbed our message that Hanukkah isn’t mostly about gifts. Now big enough to do it himself, Simon lit the candles on his menorah while his dad lit candles on another. We sat in the living room talking and playing dreidel as the candles flickered. I had a small present for him – for “craft night.” Before I could pull out the gift, Simon asked, “Can we play dreidel?” He does not anticipate presents during Hanukkah nor do we ask him to make a wish list. My son, by example, is showing me how to enjoy not just the lights of Hanukkah each night, but the lights we see dotting the trees all over our town. He is, as he did the other day in a Starbucks, teaching me so much about what it can mean to be a Jew in America. Ps. 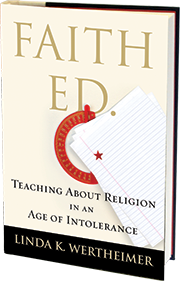 I’d love to hear others’ stories about how you cope with being a religious minority during the Christmas season – as well as recommendations for books on Hanukkah or winter holidays that would work for a Jewish audience. Tagged Chanuka, Christmas and Jews, Hanukkah, Hanukkah books, Jewish children's literature, New York Times Motherlode. Bookmark the permalink.